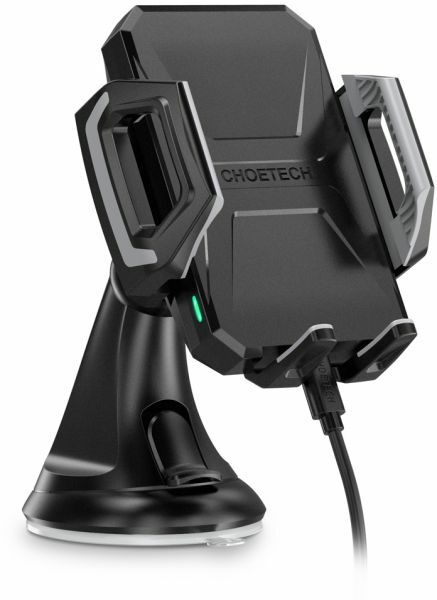 【Universal Wireless Car Charger Mount 】Wireless car charger holder can be used as a wireless charger as well as a car mount. just place & enjoy wireless charging, without to plug your device in to USB port. Phone holder width is 2.6-4 inch. [ATTENTION: PLS DON’T charge your phone while using GPS or watching videos]. 【Fast Charge and Compatible】Fast wireless charge up to 10W for the Samsung Galaxy S9, Note 9,Note 8, S6 Edge+, S7 and S7 Edge, S8, S8 Plus, 7.5W wireless charging for iPhone XS/ XS MAX/ XR, iPhone X/8/8 Plus ( pls use QC2.0/3.0 adapter and usb c 2.0/3.0 cable) and 5W standard wireless charge for all Qi-enabled Phones. 【Versatile Viewing and Fixation Design】With fixation design and non-scratch silicone protective mat, your phone can be held firmly and securely. The 360°rotating ball joint on both mounts enables flexible viewing angles while driving, charge vertically or horizontally for ideal use with Face ID. 【Latest USB Type C Port and Certified Safe】Unique design of the usb type c connector makes it easier for type c phone users, let you charge your phone wireless. comes with overcurrent, overheat, over-voltage, and short circuit safeguards, and more, you and your iPhone are fully protected. 【Charging Alignment for Seamless Charge】With adjustable foot support design to find the Qi receiver spot of your smartphones, please press the bottom button at the back to make foot support completely down, and then adjust it to ensure effective charging alignment for seamless charge. 1.To keep high charging efficiency, please remove the protective case while wireless charging. 2.Fast wireless charge need QC 2.0/3.0 adapter. 3.It is incompatible with Apple Watch. 4.PD adapter can’t support fast wireless charge. 5.Metal and magnetic attachments or credit cards will damage your phone, please remove all these types of case before charging on fast wireless charger, works with Rubber/Plastic/TPU Cases etc, MUST be within 4mm. وهي تعمل كما وعدت! أحبه!! ليس من الملائم إجراء تغيير على هاتفي عندما يكون في مكانه ، ولكنه لا يزال يستحق المال! من السهل أن نرى الخرائط! أنا أحب هذا حامل الهاتف الخليوي وشاحن للسيارة. أستخدمه لعقد هاتفي أثناء القيادة ، حتى أتمكن من التركيز على القيادة ومع ذلك لا أزال أرى ما إذا كان هناك شخص يتصل بي. هذا هو حقا مريحة وآمنة للقيادة! يبدو المنتج وكأنه يمكن أن يبنى بشكل أفضل ، ووزن خفيف إلى حد ما. ومع ذلك فقد عملت كبيرة بالنسبة لي مع أي قضايا nbn على الإطلاق.